Vote over at Top Web Comics and you can see a mysterious panel from tomorrow's page. OoooOOOoo... I miss Parks & Rec. Anyway, this is mostly a page of running! Gotta flex them werewolf muscles and get that anxiety under control. Little by little, Malaya is going to figure out that it's kind of fun to be a werewolf, but she has to try on that identity a bit more often. 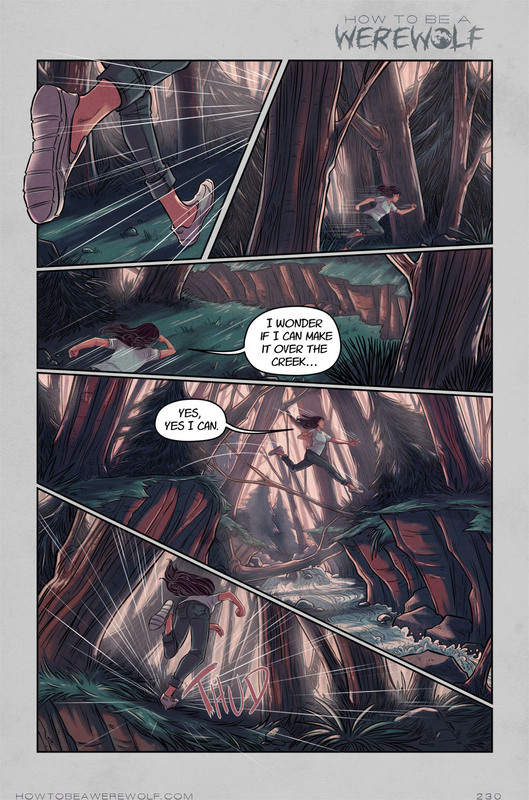 Also, this page was a good excuse for me to draw forests and stuff. I don't think I've drawn a forest the same way twice, which is because I don't want to. Figuring out the pose for that last panel was kind of a nightmare. I've got a program called DesignDoll. The base version is free, but doesn't have a ton of functionality. Basically, it's a 3D anime-type character that you can position however. Very useful for figuring out poses with a lot of foreshortening! I wish the character's head wasn't alien huge, though. I think you can modify a lot of things and import more character types if you buy the program, but it's fine for my purposes...which is that I can only imagine the human body in 3D to a certain degree, because I'm not a wizard. I spent most of my time while drawing these pages watching Jane the Virgin and Grand Designs, which are totally different shows. Jane the Virgin is fun, but the telenovela plots kind of leave me emotionally exhausted. It's like watching ping pong. My personal writing style doesn't lend itself to a lot of high drama, because I generally don't prefer those kinds of stories. I like Jane the Virgin, but I can't watch it for very long...which is why I've watched all the episodes of Grand Designs on Netflix. Basically, it's people in the UK building super modern buildings in odd places, I guess? Or in odd ways. One dude was building a mansion out of a mud and straw construction. I'm not a big fan of modern design, personally. I like it because it looks clean, but I prefer the sturdy frilliness of my own pre-Victorian home. I like Grand Designs mostly because it makes me feel better about the amount of money I'm spending renovating my house :P. Getting new floors in the living room next week! Finally. Ugh, that's gonna be a nightmare moving all my damn furniture. Okay, off to finish tomorrow's page! Because I'm behind.